← 100,000 hits. Thank you! Have you ever noticed that all the windows on our City Hall towers face inward? Nine hundred and sixty windows looking at each other, and zero facing outwards. This can serve as a metaphor for the state of public engagement in Toronto. Many citizens feel that their voices aren’t heard at City Hall, and many don’t even know when, where or how to interact with the democratic process. 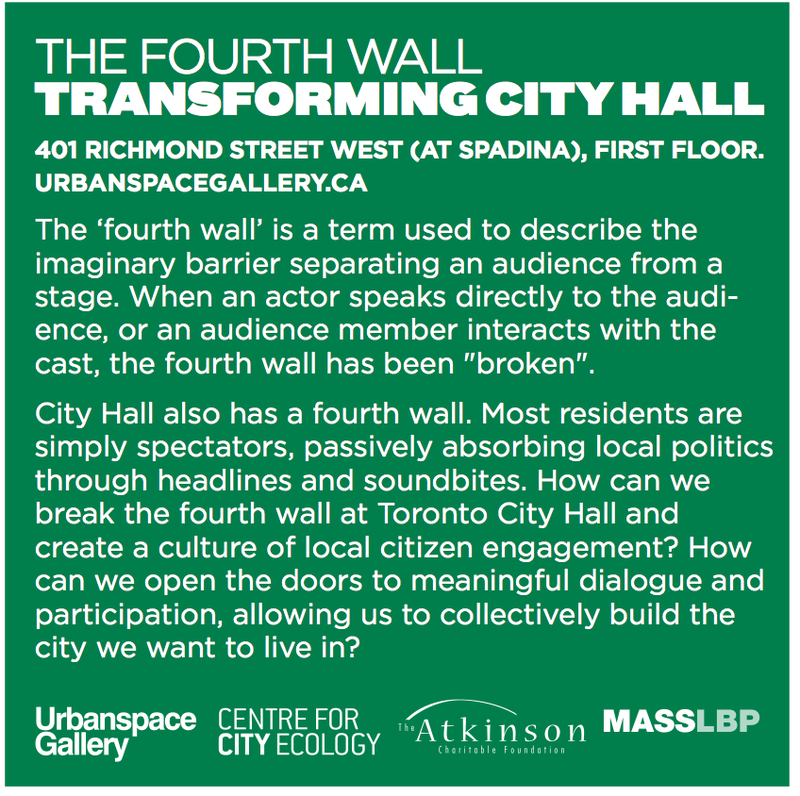 I’ve been putting together an exhibit for the UrbanSpace Gallery that explores this topic, working with researcher Hilary Best and designer Adam Zinzan-Harris. 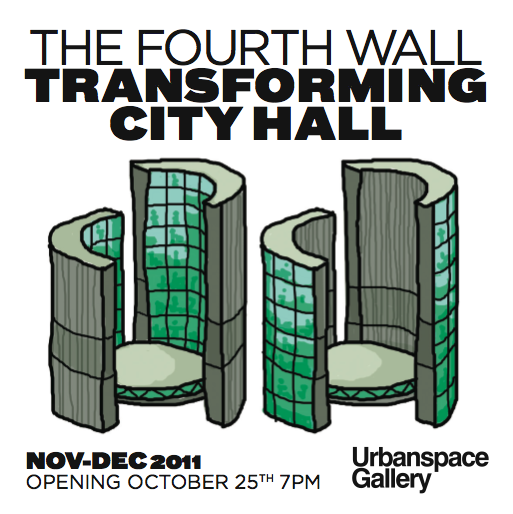 We’ve got a neat little show, and some concrete ideas about how to make City Hall more accessible, inviting and participatory. We’re excited to announce the launch event, on October 25th! Does that date sound familiar? It should – it’s exactly one year since our 2010 election. We hope you can make it! If not, the exhibit will be open for all of November & December so drop by anytime. This entry was posted in Better Ballots, Community Organising, The City is Beautiful, The Fourth Wall, Whose Space is Public Space?. Bookmark the permalink. Very interesting. Our city hall is all two way glass so that as Mayor and Council we can see what is happening, including the fire engine leaving the station, police dispatches and unhappy campers about being snarled in traffic as we are doing our best to make it more walkable and safer. Furthermore, we have three open workshops each month in addition to our two regularly scheduled City Council meetings. We do not vote, anyone resident is encouaged to come to the table and share when we discuss an issue of interest to them. I often alert individuals, non profits and trade associations when a topic is of interest so they do not miss the opportunity. Furthermore, our five member council sit around a large conference table and visitors join us literally at the table. The net result is more informed council decisions and a public that knows we are listening to them . . . though we may not always agree. Having been in politics for many years, and at all levels, I understood early on that I learn with my ears and not my mouth. I send out hundreds of email newsletters and invest two to three hours a day responding to everyone whot takes the interest to write. I believe we are as transparent as we can be and that my principal role as mayor is to lead a civic conversation about tomorrow. It is working and we have reduced the cost of government and increased the level of basic services because we have listened to the people and found ways to reinvent old ways. Saw the article in the Star. Am very interested in the “boards” you have prepared for the exhibit. Do you have images? FWIW, in the 2009 cycle of Comp. Plan Amendments for Washington, DC, I submitted an amendment that would have created a “civic engagement” element of the Comp. Plan, focused on these kinds of issues, information dissemination requirements, how the govt. is organized to foster participation (in DC my joke is that big govt.–the federal government–trickles down and shapes little govt.–the local govt.–in its image), where it holds meetings (lots of govt. agencies hold meetings in locations that are very difficult to reach by public transportation), etc. Mez, you rock AND roll: EX15.16 Jan 24/12 Executive Meeting puts your agenda on the table. … we are looking for contributors to our first theme exhibit “Architecture of Fear” (and anything related to urbanism, city/rural planning, etc. )… you are on our list as a potential…. give me a shout if you are interested.